This evening I went out at dusk to take a few pictures. Driving by Our Lady of Perpetual Help Parish, I was drawn in by the peaceful setting along the side of the church. 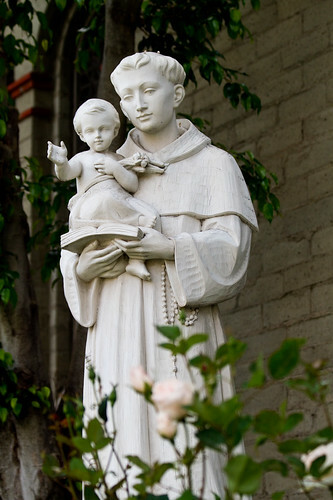 There is a smallish garden of flowers with this statue of a priest and child. The setting had such a feel of quiet and serenity. It was a nice way to end my day. This is a pleasant statue. I like how crisp your photo is! This is so appropriately titled. It is particularly peaceful because of the cool white set against the aged grey bricks and framed by the living green. Both of these comments are exactly right. Where have all the old houses gone?